Cuba still mourns. The stories are revealed hour after hour, day by day, while relatives and friends of the victims of the plane crashed last Friday cry, suffer and feel the pain deep inside their hearts. 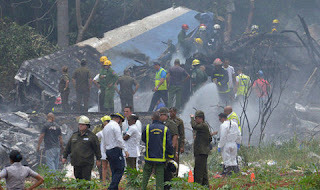 The commotion is general in the entire island, in all Cuban people, while domestic authorities together with international institutions of the Civil Aeronautics continue the inquiries about the accident. A catastrophe wrapped in a deep mystery, especially by the procedure that for months Damojh, the leasing company of the plain, had. So far, the Directorate General of the Civil Aeronautics in Mexico (DGCA) has decided to cease that airline’s operations. Authorities, specialists and researchers continue to analyze the records of the plane including its black box. Independently of the results, they reveal to the media, several clues evidence the terrible operability of the Mexican company. According to the DGCA, they decided to suspend Global Air for a "major extraordinary verification" aiming at verifying they comply with the required regulations and standards for their operations. In addition, the temporary suspension responds to the need to compile information to contribute to the investigation initiated by the Cuban government. The governing body of the aeronautical activity of Mexico sent two experts to Havana to collaborate. Also, in the Cuban capital there are members of the National Transportation Safety Board, an independent entity in the United States specialized in investigating air accidents. Cuba has been short of a large fleet of aircraft for several years. Cubans have not been able to access the aircraft market due to the economic blockade imposed by the United States, which prevents them from accessing the best airplanes in the world. Although the nation has acquired plains through France and Ukraine, the lack of spare parts has made them inoperative. Hence, they lease low-cost aircraft and airlines such as Damojh. That's where problems start. The Mexican company carried on its shoulders several complaints and suspensions for security reasons. The first suspension occurred in 2010 after an emergency landing in the tourist resort of Puerto Vallarta, Jalisco, Guadalajara. According to the report at that time, the nose landing gear got stuck when arriving at the airport. The cancellation of operations lasted just one month. Two years later a pilot, Marco Aurelio Hernández, complained against the company, which set in motion a deep investigation that kept one of Damojh's aircraft on the ground. Hernandez who worked since 2005 with the airline made claims due to several technical failures that according to his expertise had the Damojh plains, one related to engine failures. In fact, although it is not known if the damaged plain is the same, some eyewitnesses of the catastrophe commented that one of the turbines caught fire from the plane's takeoff. In an interview granted by Hernández to the newspaper El Milenio, the pilot expressed his dismay and concern because the company did not offer adequate maintenance to the equipment. He also argued that the company's mechanics did not have the necessary spare parts to do their job. In contrast to the pilot's statements, there are the certificates shown by the company to the Cuban authorities, in which the last revision occurred in November 2017. Another problem referred to by Marco Aurelio was related to the communications and the electrical systems. Ovidio Martínez López, a Cubana de Aviación pilot for more than 40 years, also reported that in 2010 and 2011 an airplane of the same Mexican company disappeared from the radar during flying through the city of Santa Clara. At that time, the Cuban authorities had already warned not to rent again Damojh’s plains. However, Cubana once again chose to rent the company that emerged in 1990 under Global Air, a company dedicated to rent aircraft with crew. Damojh belongs to a Spanish businessman, Manuel Rodríguez Campo, who is linked to other airlines in Latin America. Among Damojh’s irregularities, there is the violation of flying with baggage excess. In 2017, under the operator Easy Sky, the crashed plane flew into Guyana's airspace with overweight. Curiously, Cubana was not aware of these incidents before hiring the company. However, it is quite fishy that Damojh only has three Boeing 737 airplanes, two 737-300 ones and the 737-201 that fall in Cuba. Precisely, among the experts who are on the island investigating the accident, there are the ones of the North American company leader in the manufacture of airplanes. The 39-year-old B-737 plane with license plate XA-UHZ owned by Damojh crashed on May 18 as soon as it left Havana airport with 113 people on board. Official Cuban media reported on Monday the death of the 111th victim, Gretell Landrove, 23, who was hospitalized for three days with very serious injuries. Her mother, Amparo Font, said her daughter was a flamenco dancer and an engineering student who was about to graduate from college.